Uncle R.B. 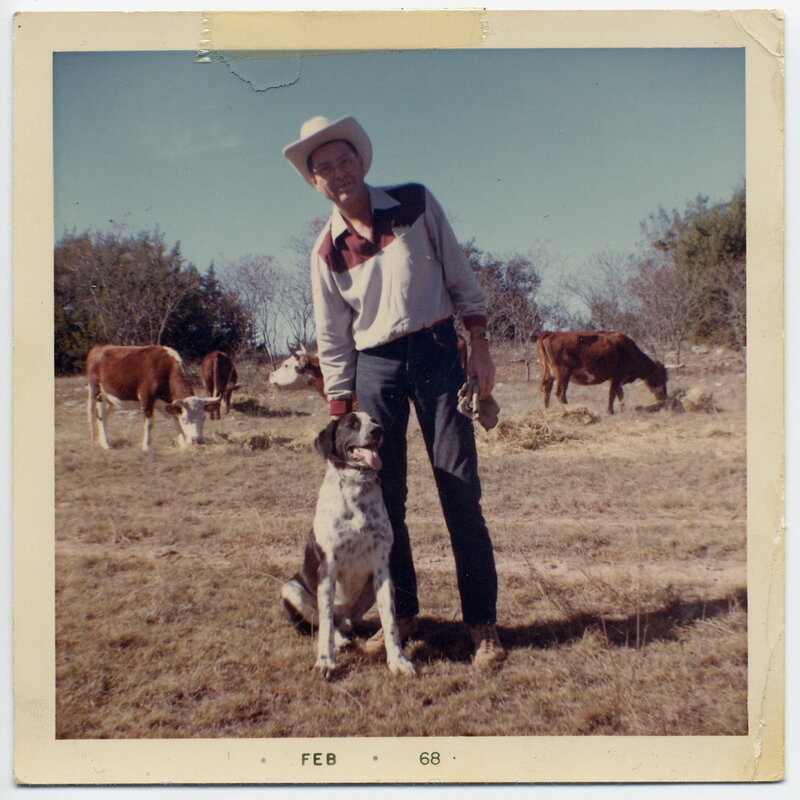 considered the dimple-C ranch in Duffau, TX his true home—several hundred acres of grassy pasture, Mesquite trees, a few dozen head of cattle, and an old, black farm truck from the Hoover administration. By the time I was tall enough to reach the floorboard starter button, I had mastered the art of driving. And, despite the sloppy manual gear stick and wobbly steering, I could proudly declare that I had never so much as scratched anything with it. Other, less responsible family members (I won’t embarrass them—they know who they are) had plowed into trees or torn a giant gash in the barn. But not me. At the ripe, old age of eleven, I boasted a spotless driving record. One sunny afternoon, Uncle R.B. and I finished feeding the cattle in the upper forty, hopped in the truck and headed back to the house. Aunt Montine had supper waiting and I could hardly wait to eat it. As I guided the truck through an opening in the fence between pastures, the front tire caught a rut, jerked the wheel out of my hand, and before I could react, the truck made for a fencepost like it had insulted its mother. The humble post laid down without a fight, but the truck pushed on, lurching and heaving, mashing the poor picket into the ground. Finally, the black beast gave the post one last shove and stalled with a loud bang—a backfire to add insult to injury. I sat stunned, gripping the wheel with both hands, staring forward, afraid to face Uncle R.B.’s anger or, worse, his disappointment. I heard nothing for what seemed like an eternity. Finally, I gathered enough courage for a glance to my right, only to see the old cowboy twisted into a silent, gut-wrenching laugh. He finally pulled in a giant gasp, enough air to howl with guffawing so loud it flushed a nearby covey of quail. We pulled the truck off its victim and made it back to the house just in time for supper. We laughed and talked, ate pot roast, mashed potatoes, and, of course, red beans. No mention of the demolished fence post at all. The next morning, after a breakfast of sawmill gravy and biscuits, we threw a new post, some wire, and a few tools into the back of the old truck and headed across the fields. When we got to the site of my mishap, went straight to work. He showed me how to use the posthole digger, and then sat on the tailgate chatting about the weather as I made a new hole. He helped me lower the post and held it steady while I filled around it with fist-sized rocks and dirt. He showed me how to pack it down with several gallons of water and a sledgehammer—a technique that saves the cost of concrete and holds just as tight. I wasn’t strong enough to stretch the barbed wire with the come-along, but I hammered the staples in place. And after we cleaned up the tools, we sat on the tailgate to enjoy a well-deserved drink of water and admire our handiwork. And that was that. He never spoke of the demolished fencepost again. I could fill a book with the lessons I learned from Uncle R.B. during that one episode. I learned that men don’t let work go undone when work needs doing. When someone breaks something, no need to make an ordeal out of it; just have him fix it. Then, get on with life. Keep everything in perspective; people are more important than fenceposts. When a man makes a mistake, expect him to take responsibility and let him keep his dignity. If you keep misfortune in perspective, you can turn it into something that strengthens the relationship instead of something that tears it down. How a man handles a mistake is more important than how many he makes. Treat a boy like a man, and he’ll become one faster. Allow a child to take responsibility for a mistake, assist him where he’s not up to the task, and you will build his self-esteem. . . .
Like I said, I could fill a book. Mentoring is a big concept these days, with lots of manuals and seminars to teach us the right methods. Granted, mentoring carries an awesome responsibility. Look at it directly and you can’t help but shrink from the task. And probably like you, I’m not quite sure I can handle it. Perhaps if I could find the right book or attend a conference, I would feel more confident. But, then, Uncle R.B. taught me something about mentoring too. However profound, it’s not that complicated. A mentor needs only two things: a protégé and a willingness to be transparent. My uncle merely lived life as it came to him and took enough interest in me to invite me along for the ride. Our time together took care of the rest. Within your sphere of influence, God has placed at least one person that could benefit from your experience, your training, your pain, your age, or your position of responsibility. No need for curriculum. No need for an agenda to structure the learning. He or she doesn’t even need to know what you’re doing. Just extend the invitation to join you from time to time. As you work and play together, the Lord will use your transparency to expand the world of another. Who was the greatest influence in your life? How is your life or the way you view the world shaped by the influence of this person? How beautiful, Mark!!! This is so well written, it was a joy to read. I, too, had a hero in my life, this was BC in my life, and I hope you understand. It was my Father, he was a man of few words, but when he spoke, you listened (kinda like E.F Hutton). He was not a Christian, but a very moral man. And when he gave you just a side-glance with a deep frown, and furrowed brows, you felt the weight of the entire world upon you, you knew he was displeased, and this look alone, without an utterance was enough to make you pitifully sorry. My dad inspired goodness, just by being good. I often think of Jimmy Carter and his moral excellence that personified him, but I always felt a lack with him, he never seemed to inspire that in others. It was more something that he hoarded and did not emit. I could never quite figure that out, but I did not want to be like him, but my dad….yes! I think it was because my dad displayed humility, even though it was not a Christian virtue with him, you still sensed his tall, straight stature and that deep, quiet humility of his, he was also very wise. He grew up on a farm here in Michigan. His father, my grandfather, was Chief Assistant Engineer for Truck and Coach. 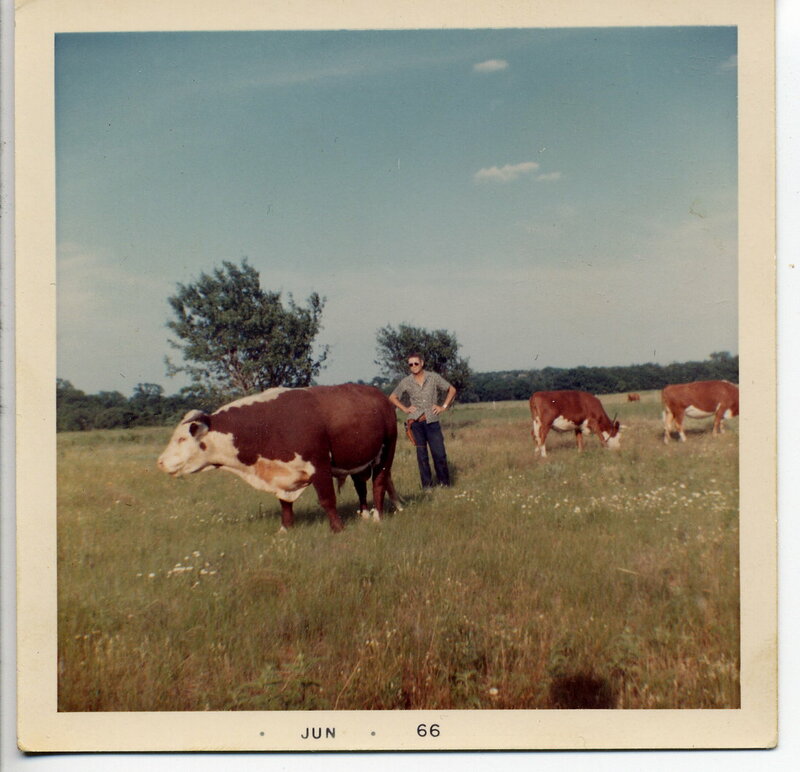 And with my grandfather’s responsibilities at work, he still was able to maintain a thriving farm with herds of Jersey cattle. I grew to love farm life…and still drive past the old plantation. Well, not quite a plantation. But the farmhouse was a unique Frank Lloyd Wright design, squatty and low to the ground, with the addition of a cupola up top that my grandfather designed. I love the old farmhouse, and the furnishings that went with it. Many of the furnishings were the “now treasured” Stickley furniture, but sad to say my mother sold most all the pieces off, as she was not a fan of her in-laws. I did inherit a set of fifty leather-bound books called the Harvard Classics from my grandfather. He was an avid reader as was my father, and my father knowing I loved to read, as well, gave them to me a few years before he passed away. They have a unique history, these books; and encompass everything from science, philosophy, literature, poetry, drama, religion, travel, all the way to important speeches and treatises of the greatest writers ever to have lived. I used to go crazy over these works until the “Lord” replaced all this wisdom of men. I really did. These giants in literature were in my father’s attic collecting dust, until one day he decided to get them down for me to see. I was like a kid in a candy store. There before me was Whitman, Rousseau, Voltaire, Franklin, Edison, Milton, Virgil..you name it, they were all there just waiting to be opened and devoured for their fantasy, knowledge, wisdom and just for the sheer pleasure of the written word. But now, one book has replaced all fifty of these men in their black dust jackets. Like Chaucer wrote, “Go, litel book!” at the end of Troilus and Criseyde, when he sent his work on a journey no man could complete. I, too, have bid them farewell as another lover has captured my heart. My book of choice now, is the never-ending story of God and His glory. The end of this story is as good as it gets! Thanks, Mary. I love to tell people about my uncle, who taught me about manhood as much as anyone. Your story just goes to show you that God is faithful to nurture and guide His own, frequently through what theologians call “General Grace,” the kind of divine blessing given for the world to enjoy. Nature, medical science, art, and emotionally healty parents (despite their apparent spiritual condition.) I’m so glad you received the dual blessing of a father who loved you and a rich library to inspire you. Obviously, both have had a lasting impact. Here’s an interesting question along those lines: What secular work of art (literature, play, movie, painting, song, etc.) has enriched your Christian walk or influenced your theology the most? For me, Victor Hugo’s, Les Miserables, is filled with so much rich theology on grace, I am amazed it’s not considered Christian literature. So palpably rich is the theme that the musical production–though written, produced, and performed by the most cynical elements of theatre society–makes me feel like I’ve been to church!